Description: Ideal for any western Party! 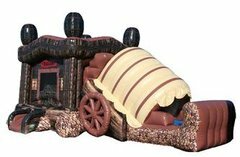 Kids can bounce in this unique bouncer and then climb the stairs and escape the Stagecoach by sliding down the slide. This Western Combo is a very large piece with a lot of detail and fun for any Cowboy or Cowgirl!